Shell, mother of pearl, rock crystal, and ebony multi pendant necklace on 11 strands of leather from Monies Denmark. 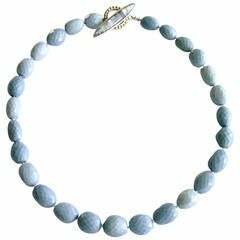 One of a kind statement piece from Danish designer Monies. 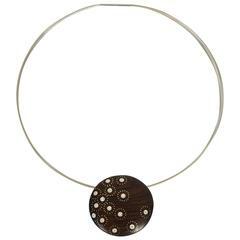 This necklace is made with multiple strands of leather and Mountain Crystal drops. 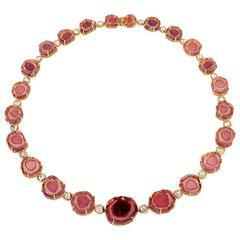 Rock crystal bead and enamel flower one of a kind necklace from Philippe Ferrandis. 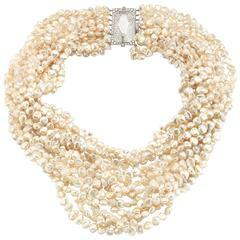 Mother of Pearl strands with rock crystal beads from Patricia von Musulin. Clasp is solid sterling silver. Magnificent one of a kind Fancy Yellow Diamond Necklace, set with 183.08 carats of Fancy Yellow Diamonds.